Most violins, violas and cellos require regular maintenance. McLaughlin Violins specializes in exacting procedures that can usually be done in a day or two after an initial, complimentary evaluation. Instruments must be seen in person for accurate estimates to be given. 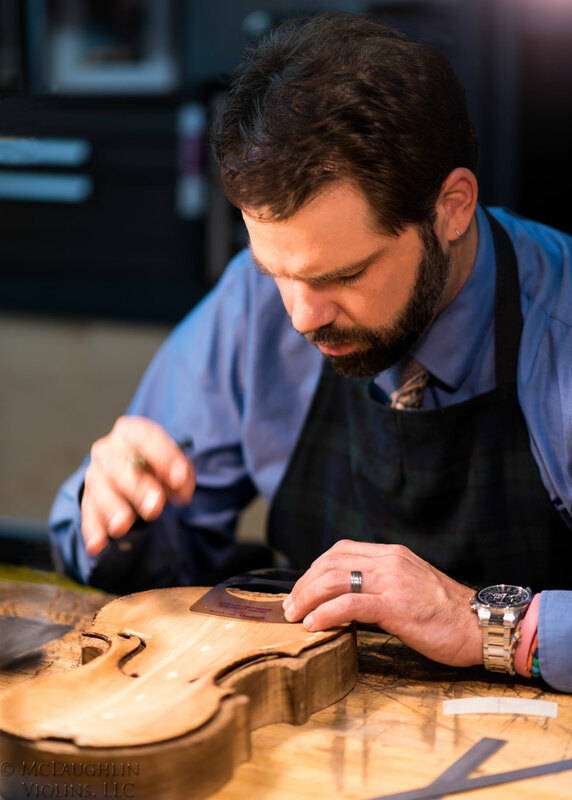 Scroll down to learn about Ryan McLaughlin, luthier and owner of McLaughlin Violins, and Sean Lee, violinist and Sales Associate. Browse a sample selection of top quality instruments for sale, and find the ideal instrument for any musician; from budding enthusiast to seasoned performer; tuned, tested and adjusted to ensure optimum performance, including fine, handcrafted professional instruments capable of incredibly intricate tones. Players seeking a rental instrument with the richest, warmest possible tone, combined with the extraordinary handling and playing characteristics of an owned instrument choose to rent from McLaughlin Violins because of our attention to selection, detail and upkeep. Ryan McLaughlin, has been working on instruments since he started playing bass guitar at age 14. He went on to play double-bass, eventually attending the Brevard Music Festival as a bassist when he was 17. There, his counselor was the in-house luthier, and Ryan’s eyes were opened to what would become a lifelong passion. Ryan McLaughlin is on the Board of Directors and a member of the Violin Society of America. He is on the board and a member of the American Federation of Violin and Bow Makers. All photographs on this site © McLaughlin Violins. All rights reserved.